Special Offers are here. On the fence? Time to get off it. downline = possible spillover for PrizeClickers members. are run by proven admin and pay. around the problem. You can also get in touch, I will help. SolidTrustPay - Payeer - BitCoin(10% disc.). --> Other options available, read FUNDING post or get in touch. Ethereum and other payment options will possibly be here soon. 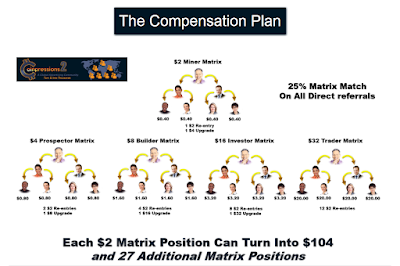 A $2 Stage 1 Matrix Position - at CoinPressions2. Coinpressions2 and the start of Special Offers. of them, hold no interest to me. touch, I'm always here to answer you. buy first at Stage 1, then 2, then 3 etc. for all 5 Stages($62.00) from the start. and great benefits for referring but what else? stages - they all come with more ads. Stats - Status of your referrals and their referrals(paid and free). Who is in your 2x2 on every level? You can get the details. stay connected with other members. members area. Questions? I'm here. a FREE $2.00 Stage1 added. The above is part of the special offers coming, enjoy. Is it still a good site? support gets answered and crucially it is still PAYING ON TIME. fee, depends on your processor - STP is 0.37c). the program, the only changes have been positive. 1. Two additional payment processors to take it to four available. *Use BitCoin, get a 10% discount. wait for a special offer coming in the next few days. XP Winners - February 13th. Some XP given out tonight. XP Winners - February 11th. Some XP given out tonight....more to come soon. wallet(about 5 thousand years. lol). BitCoin Bow - similar to the above. Dayuzarce - site no longer working. pointless to update these pages constantly. Information on a new program - CoinPressions2. programs like WordLinx and Rotate4All. Until later, have a great weekend!